Location: Trim, County Meath, Ireland. Opening times: Every day from Easter Saturday to Halloween (31 October) from 10am, In winter, the complex is open only on weekends and bank holidays. Notes: Trim Castle is a Norman castle on the south bank of the River Boyne in Trim, County Meath, Ireland. With an area of 30,000 m², it is the largest Norman castle in Ireland. 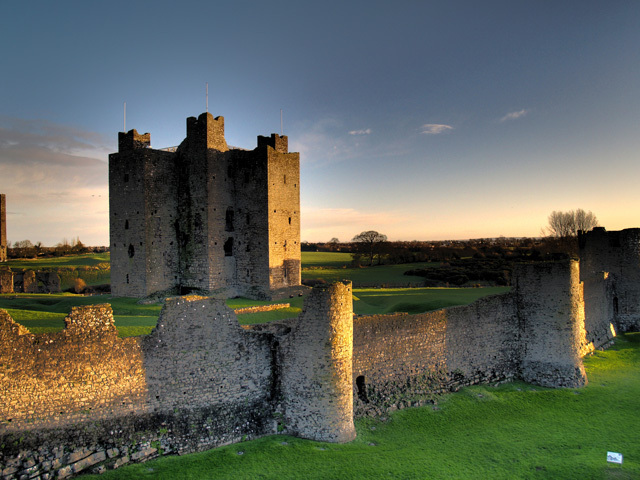 Over a period of 30 years, it was built by Hugh de Lacy and his son Walter as the caput of the Lordship of Meath. The Office of Public Works began a major programme of exploratory works and conservation, costing over six million euro, including partial restoration of the moat and the installation of a protective roof. The castle was re-opened to the public in 2000. Trim Castle is open, on payment of an entry fee, to the public every day from Easter Saturday to Halloween (31 October) from 10am. The area inside the castle walls is freely accessible for an admittance fee, while access to the Castle keep is via a 45-minute guided tour. In winter, the complex is open only on weekends and bank holidays. The Castle is noted for the part it played in the filming of the Mel Gibson directed film Braveheart. In 2003 there was a controversy surrounding the decision by the Minister for the Environment, Heritage and Local Government Martin Cullen not to oppose the construction of a five-storey hotel across the road from the castle. The development had been condemned by a local councillor, a senior inspector in An Bord Pleanala (acting in a private capacity, and later choosing to withdraw his appeal lest it be considered a conflict of interest) and heritage bodies, many of whom had been critical of the government's treatment of other heritage sites such as Carrickmines Castle (the ruins of which were excavated partly to allow the completion of a roadway). The hotel was opened in August 2006. The recent addition of buildings (including offices for the OPW) outside the west side of the town has been even more visibly intrusive to the castle remains.